While I recently visited France, I once again took it upon myself to shop for some music, something I've always enjoyed doing. I cannot help the fact that I'm old fashioned, and like thumbing through the stacks of CDs in a record store. (I'm not that old, of course, and have no recollection of looking through vinyl albums, although cassettes do seem somewhat familiar.) The American shops I used to find in large cities are almost no longer around, and this time, I wondered if the extinction wasn't soon to come to places like France. Last year I found one of the last indie shops in London; in France, I remembered an excellent experience at a FNAC. This time around, my "old" FNAC store at the Opéra near Bastille was gone, in its place, a ClubMed gym. Hmm… Another FNAC store showed me only electronics and books, but no music. DVDs are still in vogue, along with the rarity of Blu Ray. 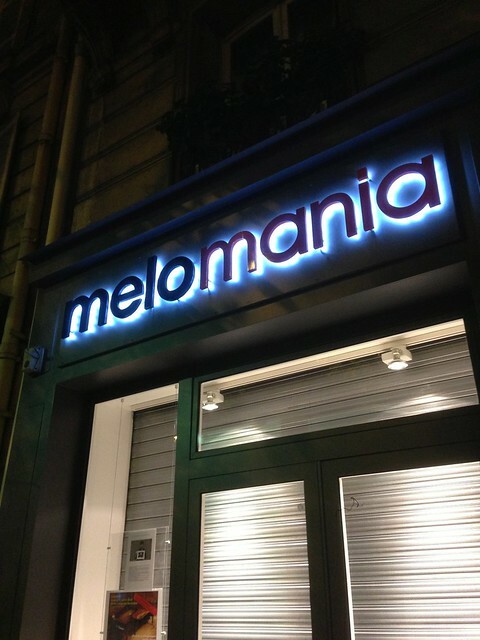 It turns out I found a place call Chaumière online, but it had been "consumed" by another store, called Melomania. It was nice and quiet, and a very nice, clean space. They used the most curious way to organize CDs that I've seen, but aside from not knowing exactly which way to follow the alphabet, I did find some values - at used prices. Since the CDs were wrapped, I'm not sure if they were in fact used or simply discounted. (I should note that I've also eaten at a restaurant in Georgetown (DC) called La Chaumière. Same name. So, that was it for Paris. The other FNAC I'd been to was closed the day I visited, so it wasn't until Lyon that I visited both a Virgin Megastore and a FNAC. The FNAC was superior in every way; it was more like what some stores we have in the US, with some small electronics and cameras for sale; iPads, an Apple "Store within a Store," and music, movies, video games, and books. The difference is, the classical section doesn't stink. They had some good values at $7, but I opted to just concentrate on new or unusual items. The Megastore in Lyon I am guessing has 3 weeks max left. Plenty of traffic, but half their bottom floor had the goods ripped out, as if they were going belly-up. No signage indicated it. The classical section stunk; the prices weren't discounted as they had been at FNAC. So, needless to say, the likelihood that in a few years you can go into a store and buy music on physical media really is making its way around the world in a "probably ain't gonna happen" type of way. The whole experience had mixed results for me. Good: * I saw a lot of CDs I already have purchased via online means (like Amazon) or digitally (iTunes). * I didn't notice a lot of stuff that I couldn't buy electronically. * CDs are a good value opposite MP3s; they may cost more, but they come with a built-in backup and are of higher quality. * I like browsing with physical media. * There's more stuff for sale online that we can reasonably fit into stores. Bad: * The CD format is dated and has been superseded by SuperAudioCD (and others). * The better formats never caught on. * No physical browsing online. * No assured means for acquiring CD-quality or better electronically - making purchases in compressed formats "compromises." In this trip at the Melomania store had a clerk that was helping a customer find what they needed; as did my trip in London last year around the same time. That's sorely what we'll be missing out the most - knowledgable staff who can give personal recommendations. Oh well, it's still fun for as long as it lasts. Apple has an excellent opportunity to make this better… * better organization of what's for sale and better search; * high-quality downloads (24 bit, 96Khz would be adequate for me); * smart/intelligent suggestions, * better integration of "art" and digital booklets (the PDF booklets especially are sorely under-cooked). If it's not Apple - then anyone - step up. But when buying from Amazon, Linn, Passionato, and iTunes - since I'm on a Mac and use iOS devices - the all Apple experience works better in some ways… integrated installation across devices, etc. is nice.